In November and December 2015, we covered the real story of the Paris COP21 climate talks — from inside the UN talks and on the streets – reporting the voices and perspectives that the mainstream media usually ignore and giving majority world voices more space to be heard. Those thanked here helped to make this happen by contributing to our first ever crowdfunder. With their help we sent two New Internationalist reporters and a filmmaker to the Paris negotiations to report. About us: New Internationalist has been reporting from the frontline of the struggle for global justice for over 40 years. A big thank you to all 272 backers who made this possible by donating to our crowdfunder! As rich countries declare ‘ambition’ while racing to weaken the text, some climate justice campaigners are turning their backs on the COP21 negotiations, reports Morgan Curtis. New Internationalist followed the ‘D12’ and ‘redlines’ actions, as people amplified their voices for climate justice. As climate negotiators in Paris release their final text agreement, millions of hectares of forest are still threatened by coal mining, warns Saskia Ozinga. 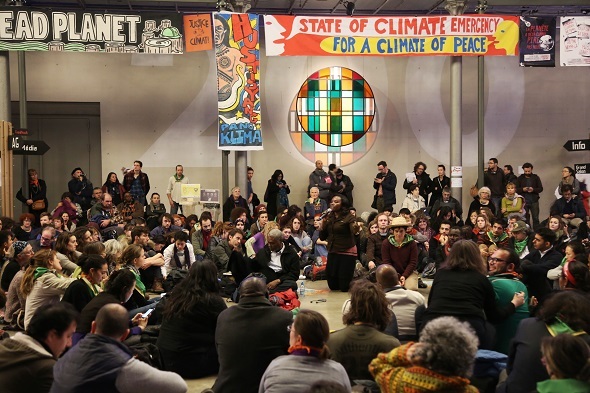 Polluters have been given pride of place at COP21, right next to the national delegations, from openDemocracy. A major rally in Paris on the eve of the U.N. climate summit was cancelled after authorities banned public protests in the aftermath of this month’s Islamic State terror attacks. But on Sunday, tens of thousands of people formed a human chain stretching for blocks., from Democracy Now!. Activist says authorities have ‘handed a megaphone to the corporations and taken the megaphone away from the social movements’. A coalition of vulnerable countries is pushing the global community to adopt a new 1.5 degree global warming target at the ongoing climate talks in Paris, from DESMOGUK. When the IPCC published their most recent fifth assessment report, something surprising and deeply disturbing was lurking in the small print, from Independent Science News. Big energy and revolving doors: a hothouse for climate change. Corporate Europe Observatory’s new report on how the energy industry is shaping EU policy. 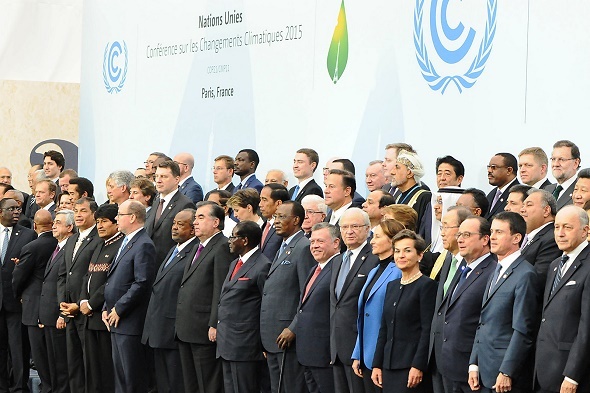 Climate talks timeline: what happened when? Birgitta Jonsdottir, the Icelandic Pirate Party Parliamentarian, shares impressions about her visit to France during the climate negotiations. My family home is on Tongatapu, the main island of Tonga. For me, climate justice is about protecting my family and where we come from, writes Joseph-Zane Sikulu. Justin Kenrick meets with Sengwer community's Yator Kiptum and Milka Chepkorir about the meaning of climate justice.. Developed countries are determined to undermine any remnant commitment to justice in this process. Morgan Curtis reports. Hundreds protested against oil sponsorship at the Louvre and ten were arrested. Jess Worth was in the thick of the action. Justin Kenrick meets with Sengwer community’s Yator Kiptum and Milka Chepkorir about the meaning of climate justice. Click the image for our zoomable infograph. The Paris climate talks are looming. What, if anything, can we hope for? One thing is certain - the summit will not deliver a plan to avert climate disaster. But we must hang on for the ride. This issue, Jess Worth and Danny Chivers look at what’s on the table at COP21, and talk to grassroots organizers looking beyond Paris.